The first soup of fall is a highly anticipated event at my house - at least by me. I’m not certain that anyone else even notices that rich, warm soups have been missing from the menu for months. For Southern California residents like myself, it takes a certain finesse to know when the time is right for that first soup. Though the first official day of fall was September 22, the ninety degree weather we were experiencing at the time certainly was not conducive to soup. Here are a few signs I look for to help me figure out if it’s time: the last tomato has been pulled from the vines in the backyard; rather than gazpacho, I start to crave something warm and substantial; and the idea of turning the oven on for a few hours sounds comforting rather than torturous. That time arrived on a recent Sunday when temperatures finally dipped below seventy and a low-lying Pacific fog that rolled in off the coast made me want to stay inside and hunker down with something nourishing. I was holding on to a recipe for Maple Carrot Soup from Delicious Magazine for just that kind of day. This soup is delicious, hearty and nourishing – all of the things one might want in a great fall soup. Just be sure to have it as an appetizer as it is surprisingly filling in large portions. Of course, since I made this soup, temperatures in Los Angeles have returned to the eighties and I broke a sweat yesterday just walking to lunch. I hear that more cool weather is just around the corner and for once, I couldn’t be happier - perhaps the result of a recent trip to New York that forced me to bundle up in jackets and scarves as temperatures dropped into the…wait for it… fifties…gasp(! )… Surprisingly, this California girl loved it and is now ready for fall with scarves and rain boots in hand and on foot. Slice the carrots about 1/4-inch think. A mandolin will make quick work of this. Line a baking sheet with a Silpat or parchment paper. Toss the carrots and onions with the ginger, garlic, maple syrup and olive oil and place on the baking sheet. Roast for 30-40 minutes, stirring and turning once or twice during cooking. If the carrots look like they are drying out, add more olive oil a tablespoon at a time. 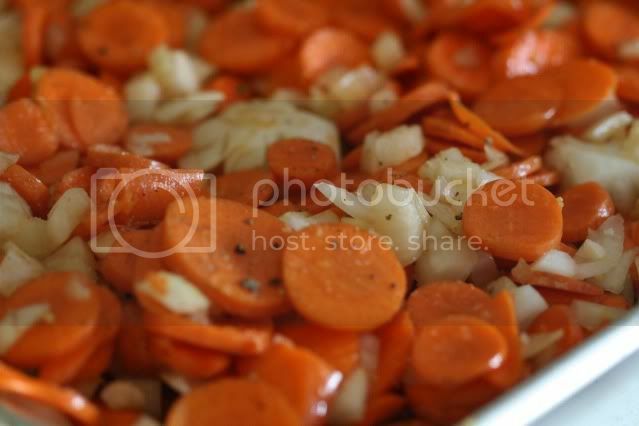 When the carrots and onions begin to soften, transfer them to a large pot with all of the juices from the baking sheet and add the chicken stock. Season with salt and pepper. Cover and bring to a boil and then simmer for about 20 minutes until the carrots are completely soft. Use an immersion blender to puree the soup in the pot, adding more water or stock as necessary to thin it out. Serve appetizer portions with a dollop of crème fraiche, maple syrup and snipped chives. Maples and carrots sound like a lovely combination, especially roasted carrots! Yum! It's definitely soup weather here: rainy, damp and cold. Today there appears to be a bit of sun but the temperature has dropped further... Mmm, I'll have to get cooking. This sounds lovely and I like the chunkiness of the finished product. omg this looks and sounds so yummy! it is well into fall here in the UK and i've been busy soup making (i love this time of year)...the thing is i don't have a blender/food processor/pureer thingy....so it's just been chunky soups, but i am saving up so this soup is going on my "to make when i can blend" list! cheers! I had been missing soup. I've cooked it a number of times the last few weeks. This one looks great. Sounds fabulous! We've had a bit of a carrot glut in our apartment lately (I couldn't resist 3 kilos for 2 euros and then when I finally got through those, the CSA delivered me 2 more kilos) and this sounds like a great way to use them up! This looks like a lovely carrot soup recipe. The maple must add such a nice touch to the soup. I have a similar problem in figuring out when fall is here (in Austin). This does sound like a great soup for cooler weather. MMMMMMMMMM,...this soup looks excellent to me!! 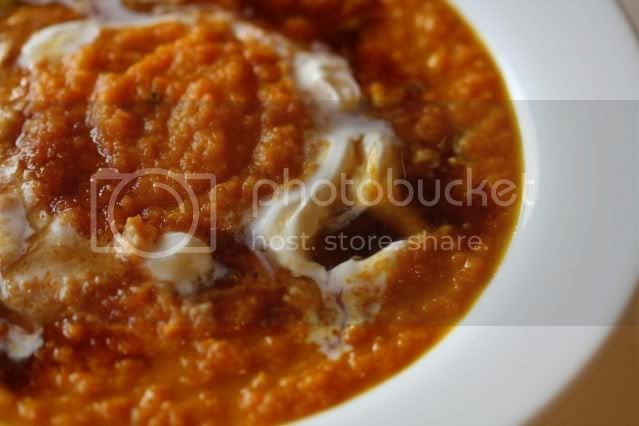 Sounds like a nice twist on carrot soup - I never thought of adding maple or sweet things. Will try it! What did you think? Is it too sweet with the maple or did it work for you? A great soup to start with! Is this more of a sweet soup with all the maple syrup? We just got pounds and pounds of carrots from our CSA winter share, so made this soup. So delicious. Thank you! I like the chunkiness of the finished product.